Cerro Electrico (7405′) with Fitz Roy looming in the background. Our route winds its way up this face along the path of least resistance. 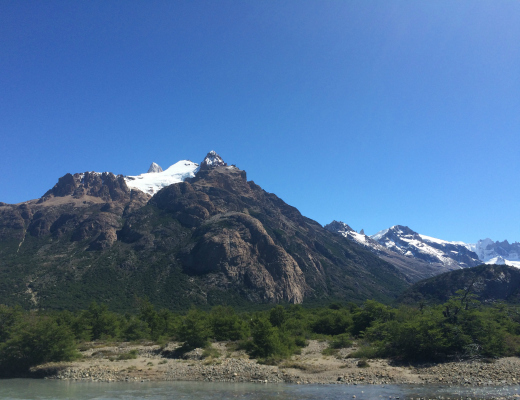 On November 18, my brother Dan and I arrived in Chalten and began madly preparing for our climb. We were there with our family as part of a longer trip through Argentina and would only be in town for three nights. We had decided on a mountain on the perimeter of the main “Fitz Roy” massif known as “Cerro Electrico,” total elevation 7405 feet. The trip can be done in a single long day but we opted to hike in a couple miles on Friday night and find a suitable launch point to camp out. I forgot a pot (Serena’s fault because I’m so used to her handling food), so we had granola bars for dinner. The river in the background was our starting point. We woke up the next morning at 3 a.m. and began winding our way along dense shrub forests, following a river’s edge until we reached a sizable waterfall. This was our first major terrain challenge and we had to navigate the surrounding bands of rock to get up to the large plateau above. Once safely perched atop the plateau, we crossed a prehistoric-looking landscape surrounded by dramatic cliffs. The lower part of the plateau was earthy and had a river running through it. The upper portion was surrounded by steep walls and its floor was made with fallen rocks that had been accumulating for millennia. 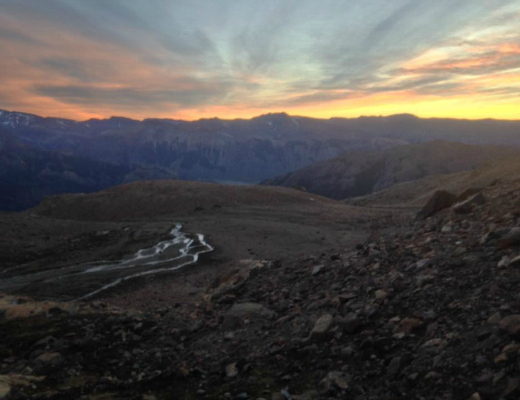 We were treated to a spectacular sunrise as we labored towards the base of the glacier. The way up the mountain. A snow-filled gully with water running beneath our feet. At last we gained the base of the glacier! We had ascended perhaps 2500′ so far and the summit stood a distant 2500′ away. 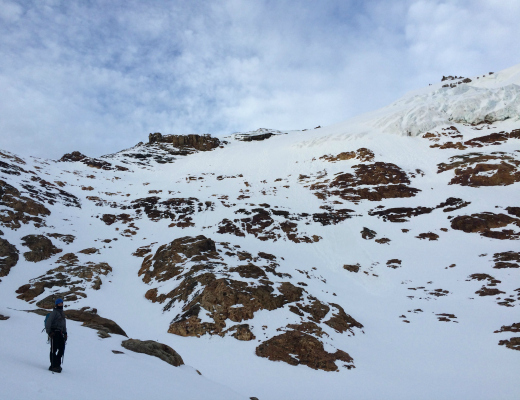 We roped up and began winding our way up the glacier, being careful to avoid the present danger—crevasses. It was somewhere along this section that my recent strategy of weight gain by minimal cardiovascular output began to work against me. Not only was I not as in-shape as I typically have been for big climbs, but I found myself punching through the snow’s crust at a rate dramatically faster than Danny (who is lighter) was. After slowly making our way up perhaps half the glacier, I benevolently offered my brother the opportunity to lead a section of the route. He did great, kept a good pace, and, nevertheless, was kind enough to leave lots of patches of snow for me to punch through. 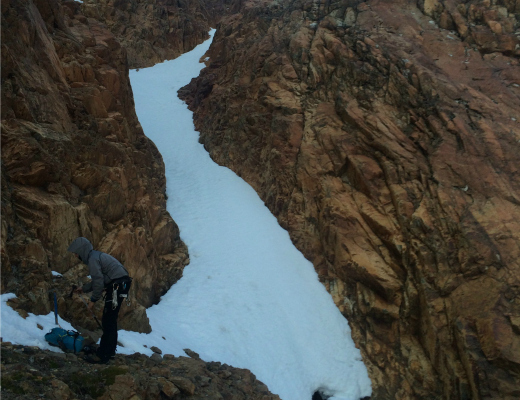 Nothing but 2500′ of snow, rock, and ice separate us from the summit. After a near eternity of this, we finally made it to the rocky section that made up the summit ridge. As is often the case, the mountain seemed to save its greatest challenges for the end, when we were most exhausted. The time was now 10 a.m. We had gained 5000′ in elevation and had been hiking since 3:30 a.m. 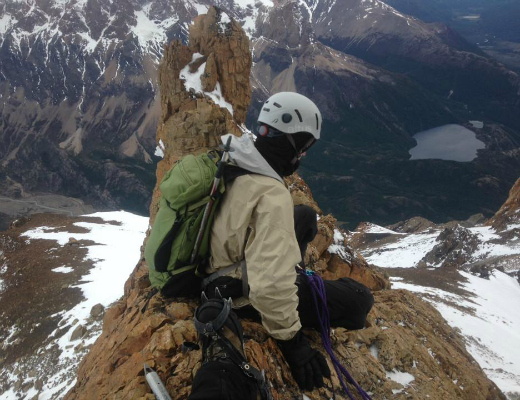 The last section involved traversing a rocky and icy ridge, at first by following it to the side, then eventually, by just straddling the ridge itself. We had made it! The only obstacle left was a 25′ rock spike that marked the actual high point. Ever one for details, I decided to climb this. Dan, ever one for sound judgment, did not. The rock here was of such poor quality that my attempts at creating an anchor failed and I ultimately decided the best option was to unrope and clamber up this last section of low grade 5 climbing without a belay. 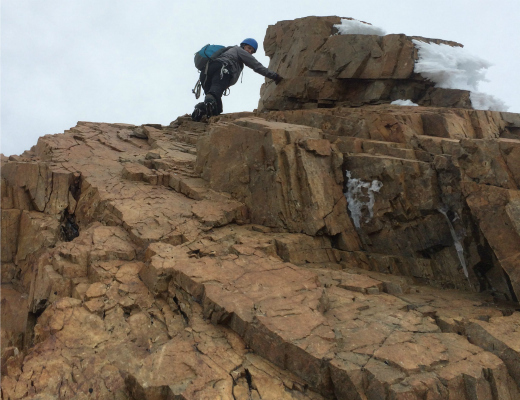 While relatively easy climbing, my heavy mountaineering boots, crampons, crumbling rock, and the certain tragedy that would follow a tumble made it a bit more interesting. Dan on the knife’s edge summit ridge with 1000′ drops in both directions. Me looking down from the true summit. We descended by approximately the same route we used to get up. Two notable diversions involved a steep snow field that would have taken forever to ascend, but made for easy “plunge stepping” on the way down, and an alternative route in the trees around the river that was easier with the exception of the final 30′ that required me to get the rope back out, lower Danny down, and then rappel myself. We arrived back at high camp at 2 p.m. We quickly gathered our things, broke down the tent, and began heading towards the marked trail (perhaps a mile down). From here it was another two miles of easy walking back to the dirt road, the nearest hostel, and civilization. We called for a taxi, ordered shots of Jameson from the hostel bar, and chilled out, finally feeling like it was safe to celebrate. Once back in town we returned the gear we had rented and made our way to the mythic restaurant described by the taxi driver (“El Rancho Grande – hamburguesas completas y porciones abundas”) and devoured massive burgers, fried eggs, and papas fritas (French fries). All in all it was a great trip offering a full array of challenges. Dan crushed it and we were both in good spirits for most of the trip despite the ever-present discomfort involved in a climb of this kind. This was certainly the most wild mountain I’ve climbed. There was very little online beta, no cell signal, no humans in sight, no trail, and very few signs of human activity. I look forward to more adventures like this in the future! There was very little beta leading into this trip. Summitpost.com (a frequent source of information regarding climbs all around the world) had no page dedicated to Cerro Electrico – so I created one. You can see it here. 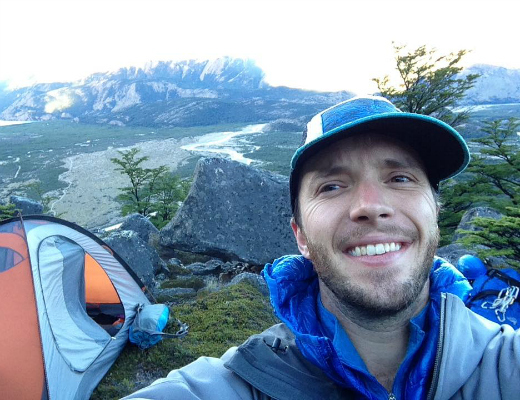 Justin Walsh is the owner of the Notch Hostel in North Woodstock, NH. He is AIARE level 1, WFR, and EMT certified. He serves on the local mountain rescue service and is pursuing his dream to be a mountain guide.